I first learned about these unique looking rubber shoes called Crocs after Bonnaroo in Manchester, Tennessee. For some reason, it always seems to rain during this mega outdoor festival, but it doesn’t seem to stop the fun… or the music. It does seem to have started a new trend in footwear. For example, last year it rained so much that people had resorted to walking (and playing) barefoot in the mud. We’re talking an entire outdoor concert event that took place in a field — a very muddy field! Finally, some ingenious footwear company started selling this unique looking shoe from a booth at Bonnaroo each year. At first, many people called them ugly, but looks didn’t really matter when you simply wanted something on your feet that would get you through the sludge, the water, and inches of mud at this outdoor event. In fact, I heard that the moment it began to rain, people were swarming to the footwear tent for these waterproof shoes. I think I heard that they sold out of every single shoe they had for sale at the 2005 Bonnaroo 3-day event. Somewhere between that rain-soaked event and now, those odd-looking shoes suddenly became trendy! And I was first in line to get a pair. It seems that people who are on their feet for long hours at a time truly appreciate the cushy comfort that Crocs provide. What Makes These Shoes So Unique? The “official” name for these shoes is Crocs. However, there are lots of similar-looking knock-offs. They’re extremely lightweight — light as air, no kidding. They come in many different colors — very cool colors that go with every summer outfit. They keep your feet cool — thanks to the cut-out holes surrounding the base of the shoe. They’re incredibly comfortable — they’re loose-fitting, with cushy soles. They’re easy to slip on & off — great when you just need to dash out of the house for a minute, or walk the dogs. They’re easy to wipe off and clean — including dog poop… and blood! They’re stain-proof — I think you could spill most anything on them & it would come right off, including “grass stains” from mowing the lawn in them. They make great shower shoes — great whenever you’re using public showers. They’re so versatile — they make great outdoor shoes, work shoes, play shoes… for the entire family! 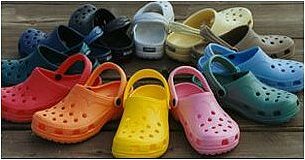 Crocs come in a variety of styles, in addition to the original clog-style. Plus they’re available in lots of fun colors. Truly, I think they’re more than just a fad… they’ve become the new “flip flop”! I have since learned that the original Crocs footwear began in 2002 and had little, if anything, to do with Bonnaroo. But it’s still a great story. Here’s how Crocs built a $1 billion business.